Both Funes and Obama lead countries strongly hit by the world financial crisis. Poverty and unemployment have increased in both their countries, and they have electorates who want their presidents to do something to correct the situation. Yet both presidents face economic forces which are greater than their governments' ability to correct. Both Funes and Obama took over the presidency from prior conservative administrations. Both presidents have constituencies in their parties which are farther to the left on the political spectrum than their president. The left wing of the Democratic Party and the hard liners of the FMLN may feel disappointment that their candidate has been more moderate than their dreams. Both Funes and Obama enjoyed high initial approval ratings within their countries. But Obama's are slipping as he finds that promising change and accomplishing change are two different things. Funes still enjoys high approval ratings, but they will start to fall if the problems of the economy and crime do not begin to improve. For both Funes and Obama, we will probably measure their success by the next presidential election. Can Obama earn a second term? Can Mauricio Funes (who is limited to a single term as president) promote the FMLN to successive terms in power? Despite their best efforts, events and forces outside of their control may determine the answers. Nice, incisive little summary Tim; congrats! I really wish we would not compare apples and oranges. Should not be done, and I believe it to be unethical. These are two different countries with very different histories. A better analysis would be to describe how El Sal is not going to be la USAs, puppet B@#$ anymore.. I also think this was a simplistic effort. The two guys come from and live in two different worlds. I can't imagine that they have much in common. 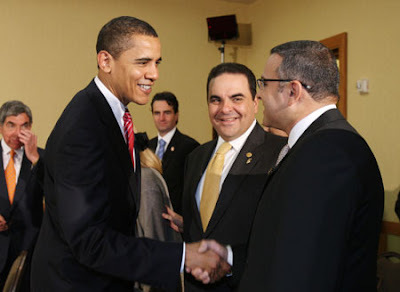 It is unlikely that Obama will have much time for Central America unless some event(s) cause him to have an interest. I don't think he has much of any background in the subject. 2010, however, is slated to be year for another try at immigration reform. In the US, only a small percentage of folks differentiate between Latino countries of origin. A good percentage, of course, could not tell you where El Salvador is located. So, comparisons of Presidents is a bit useless, unless I'm missing something here. My point is that a puppet is supposed to be useful to the pupetteer. I'm not sure how useful El Salvador is to Obama. With the cold war over for sure. What game are we playing here?